Gorgeous brocades, jacquards, and metallic are offered in brilliant colors in these classic design collars. These collars will make your pet the best dressed on the block! These are very functional as well as beautiful. 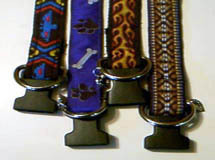 Every collar is webbing based and satin lined for your pets comfort and finished with quality nickel plated or brass hardware. These are available in many sizes. * The solid brass is used to compliment certain colors and is a heavier metal so keep this in mind when ordering. Also, collars that are 1 1/2" wide are probably too wide for dogs with a neck size smaller than a large or for dogs with short necks.